Select a page from the menu to the right to read more about CISA’s current activities and priorities. At CISA, we believe that public policy can play an important role in supporting local agriculture. We work with local, state, and national partners to support policies that work for New England farms and communities. Like CISA’s Facebook page and/or sign up for our monthly email newsletter to keep informed of state and local policy actions and select national alerts. Want to reach out to your state legislators but aren’t sure who they are? You can find out here. AFT is an organization dedicated to the conservation of farm and ranch land. They are focused on sustainable farming, healthy environmental practices and lasting rural landscapes. The Center for Rural Affiars advocates for social, environmental, and economic issues that affect rural America. Policy focused on: Rural Development in the Farm Bill; Microenterprise; Rural Health Policy; Livestock Markets, and; Clean Energy. NSAC advocates for federal policy reform to advance the sustainability of agriculture, food systems, natural resources, and rural communities. NSAC also publishes in depth analyses of the Farm Bill, Conservation, Local and Regional Food Systems, and Food Safety. NEFU is the New England chapter of the National Farmers Union. They are a member-driven organization and advocate for federal policy that will benefit family farmers, fishermen, nurserymen, and cooperatives. NOFA/Mass advocates for sustainable agricultural policies that strengthen the resilience of our local communities. 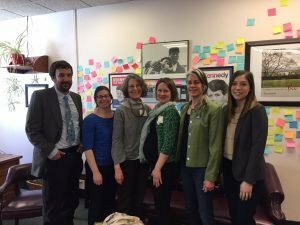 While primarily an educational organization, our policy team works on issues as diverse as organic standards, food system transparency, and reducing burdensome regulations on farmers. NESAWG is the network maintains an overview of the region’s movement on the local, state and regional level towards a more sustainable food system and guides their network members in advocacy to maximize their collective impact. If you would like to volunteer to work on policy issues, contact Kelly Coleman, Program Director, at 413-665-7100.